"Apple's next MacBook Pro will consist entirely of dongles that you have to buy separately, after paying $2,000, just because." MRF is my social media. I was clued into this one by a peer's post on LinkedIn. Remember the mock-up of the Mac that had just ONE key? Might have been back in the "old forum" days. eh, usb-c devices are out there in pretty good quantity. But I am becoming fond of this 2018 model nonetheless. It will have a single new input that none of the current dongles will fit. YET another reason to hang onto my mid-'10 MBP! We're all fairly old around here; doesn't anybody remember the doomsday debacle that was the initial iMac? "No SCSI? No ADB? No serial? WTF is USB? 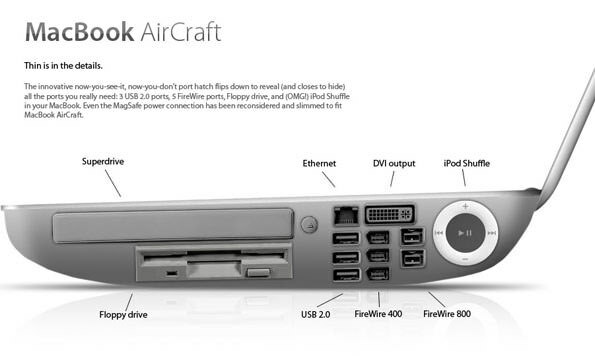 There's no USB stuff for Macs! Jobs has lost his mind!" Gotta say I've been using my new MBP and I'm not missing the ports. At work, I have power into USB-C and then one USB dongle because I have a USB security token that always needs to be plugged in. That's it. Printers are all wireless. At home, It's usually just power. I do have a Hyperdrive that allows me to easily connect two older USB, HDMI, SD card. That's a pretty good improvement. Only 2 cables need to be unplugged and replugged when using the MBP somewhere else and then putting it back. Otherwise, you'd have to un/replug 6 cables. A TB dock could reduce that to a single cable. No laptop would be immune from this setup. Is that your photo? cause it looks 'staged' -- as in "let me just plug something in all of them" kinda thing. Or its laptop user still thinking like a desktop user. "cause it looks 'staged' -- as in "let me just plug something in all of them" kinda thing." I borrowed this photo from a Reddit post titled; "This From A Trillion Dollar Company"
I thought it somewhat fitting for this thread. So kinda staged, but I also agree with Lew -- its not bad. If you had a Dell, you would need 7 ports and 7 cables for that same solution. I say 7, because you need a seperate power cable too. t wasn't the USB hardware, it was functional Mac USB drivers.